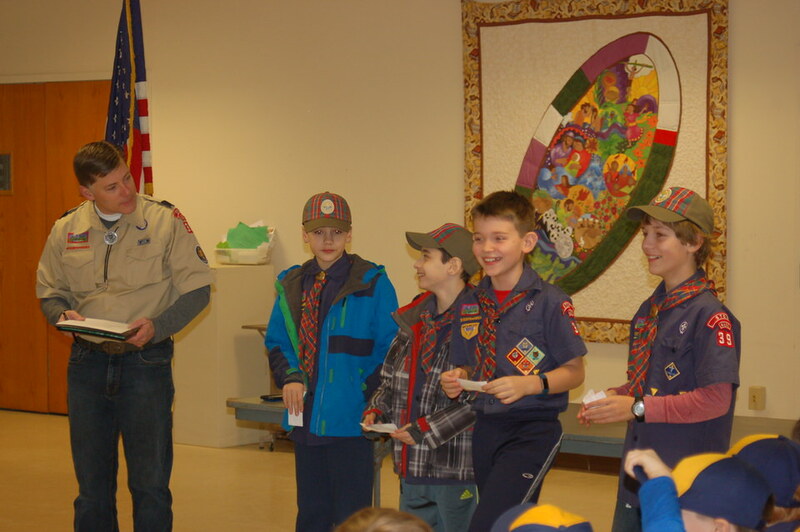 Pack 39 relies on dedicated volunteers to make our program flourish. 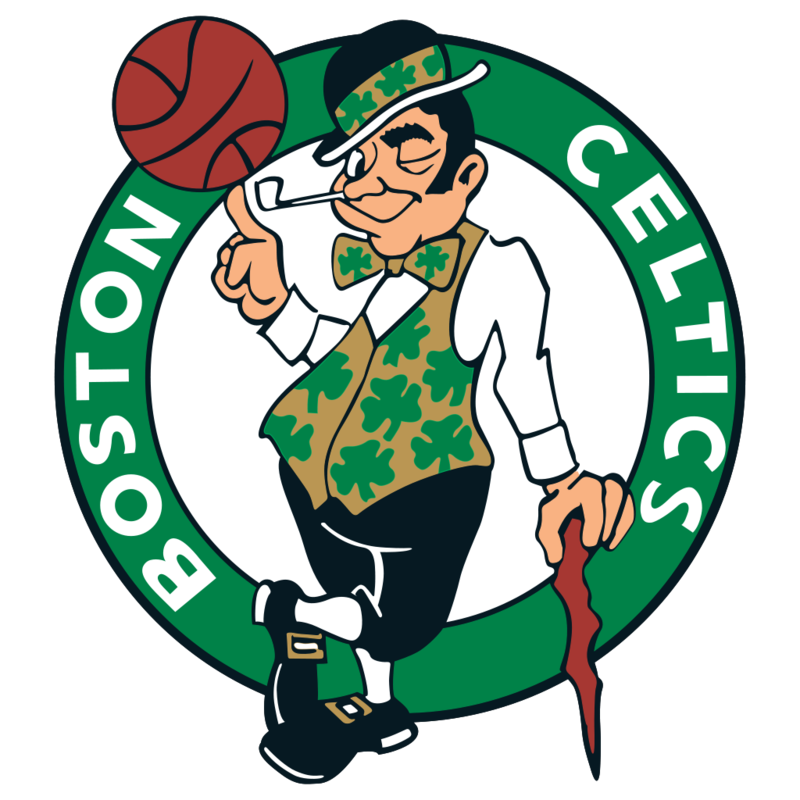 Right now we need you. 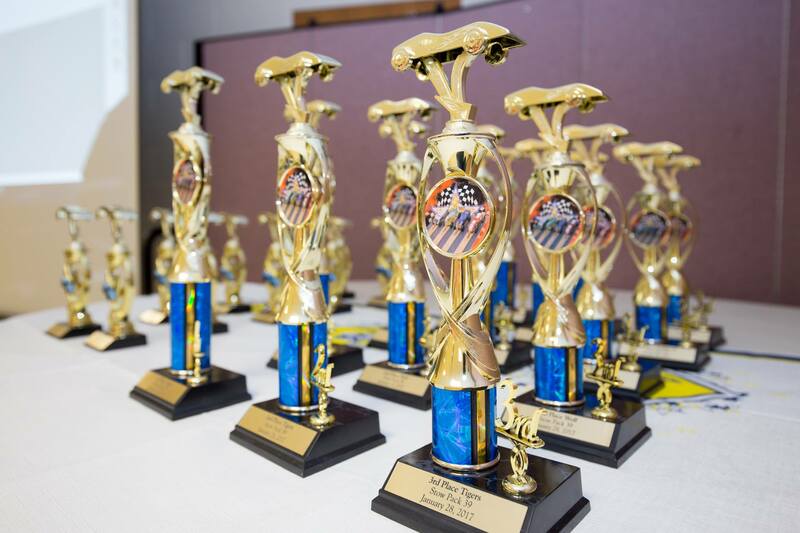 We need volunteers to help with the Pinewood Derby Friday night January 27th and Saturday morning January 28th. 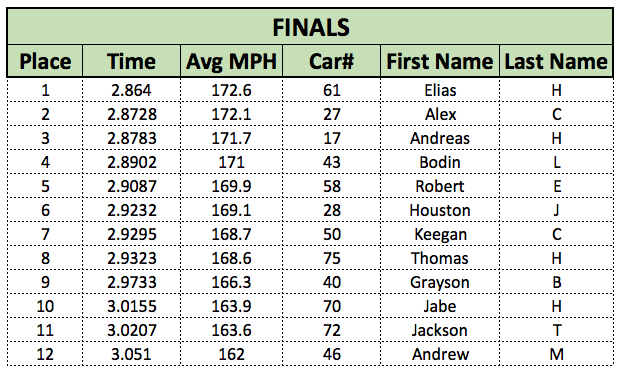 You can help for the entire event or even just for one hour at at time that your scout is not racing. Sign up and we will work out the hour(s) you want to help. We have setup a SignupGenius link to help organize, please volunteer for a timeslot! 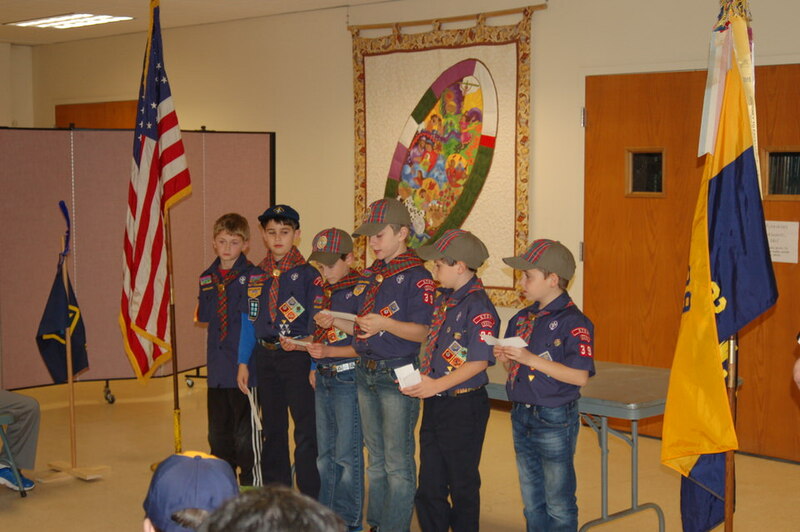 Our meeting opened with Wolf Den 1 presenting the American and Cub Scout Flag and then leading the group in the Pledge of Allegiance. 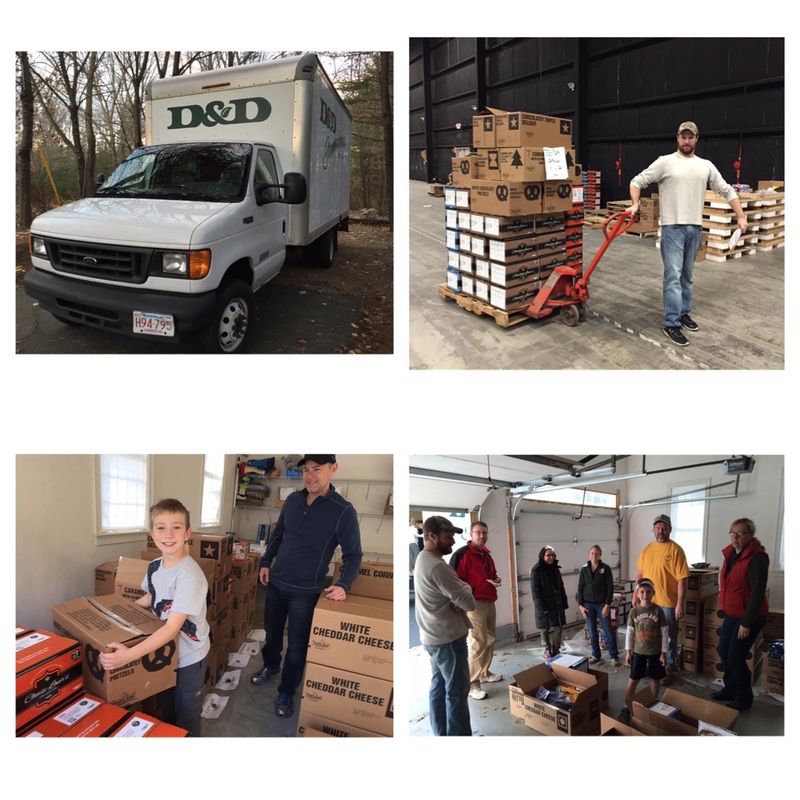 Arrow of Light Den 7 asked the Pack to help them with a service project for NEADS, National Education for Assistance Dog Services, Den 7 would like everyone to bring a container of creamy peanut butter to the February Pack meeting to help with puppy training. 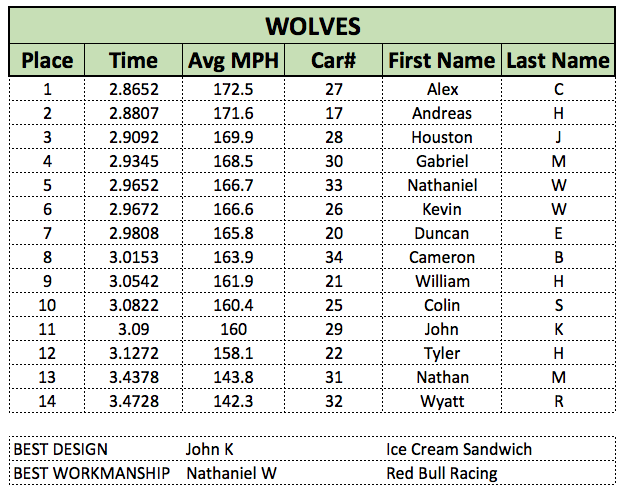 Overnight – Make sure your forms and payment are submitted. 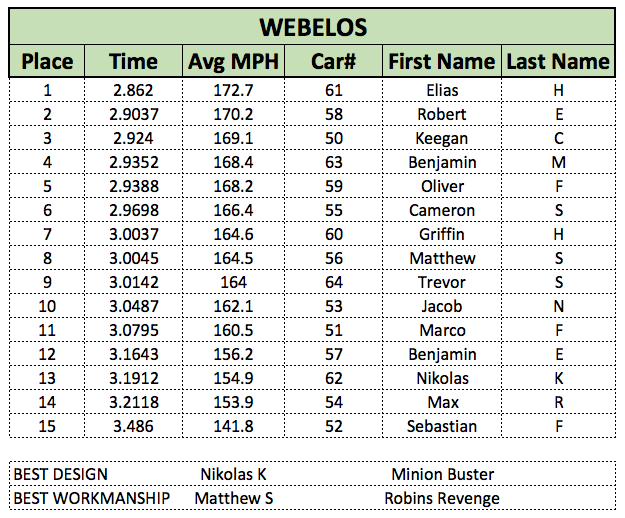 Pinewood Derby – The derby is just a few weeks away. Make sure your you have read the current year Knox Trail Council rules, and that your scout car meets the stated requirements/restrictions. 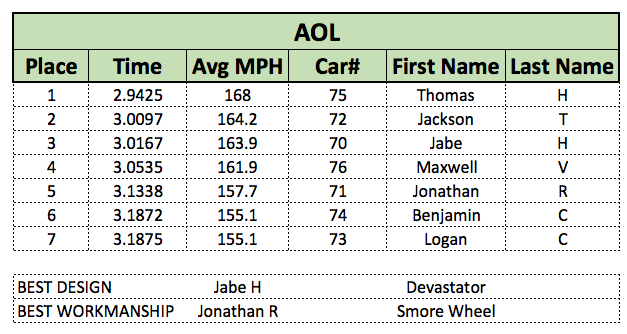 Only cars that meet the current year rules will be able to race. 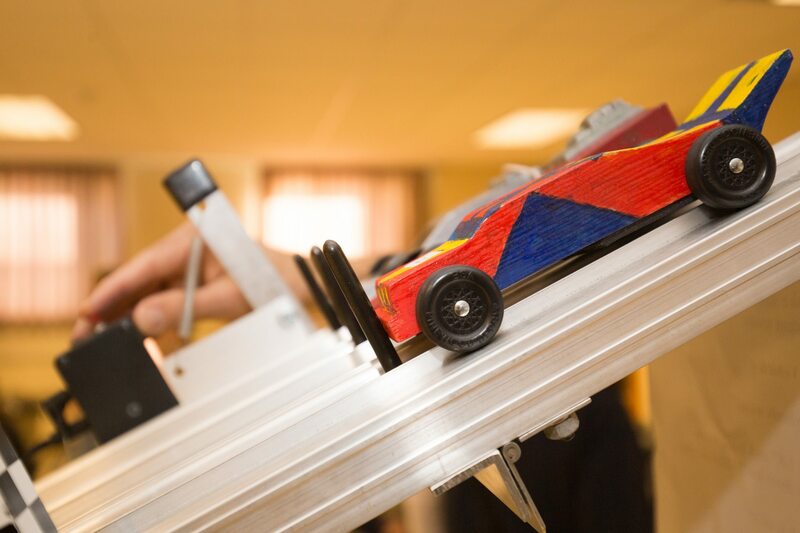 Slot Cars – Slot Car racing and Pinewood Derby Car racing is Jan 22nd. 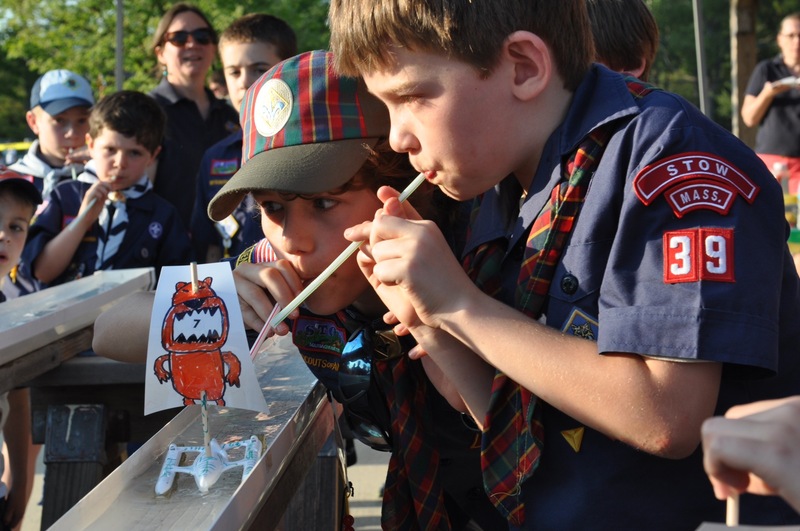 Campership – WEBELOS are encouraged to apply for the Benoit Campership for a free week of camp at Camp Resolute this summer. 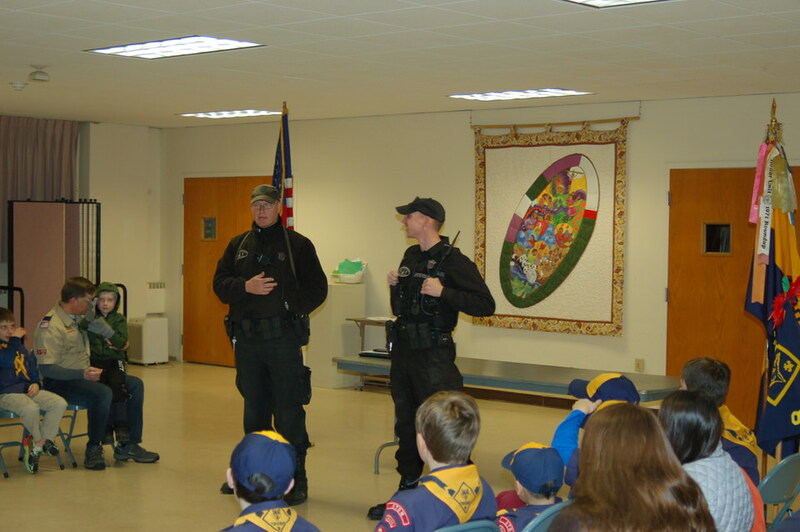 Pack 39 was please to welcome Massachusetts State Police officers Tom and Chris from the State Police K-9 Unit. They answered many questions from the scouts, siblings and parents on the State Policemen’s jobs, working and training the police dogs. 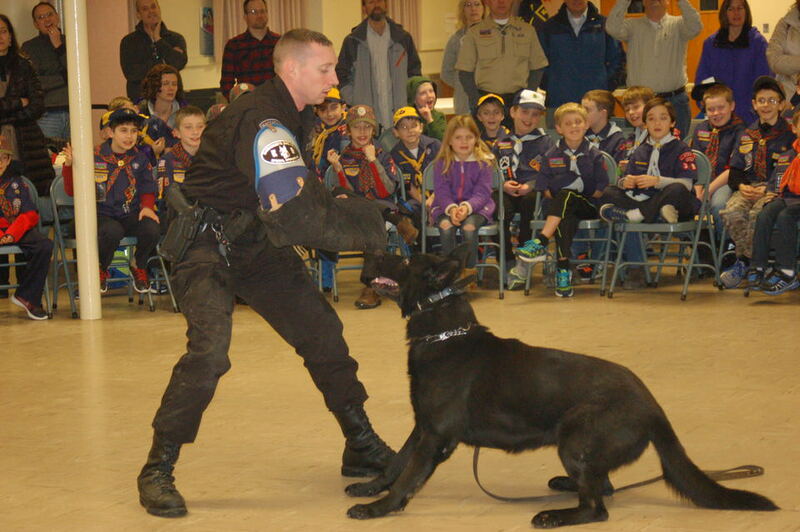 The officers then brought in the Police Dogs Devaney and Tank, and showed off their disciplines and skills. 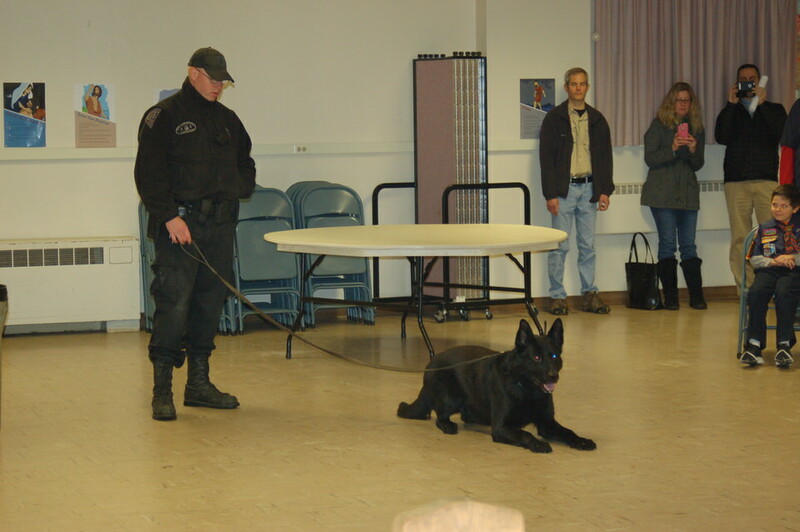 Devaney showing complete attention to Officer Chris and his commands. Tank waiting for the command from Officer Tom to get his ‘bad guy’. 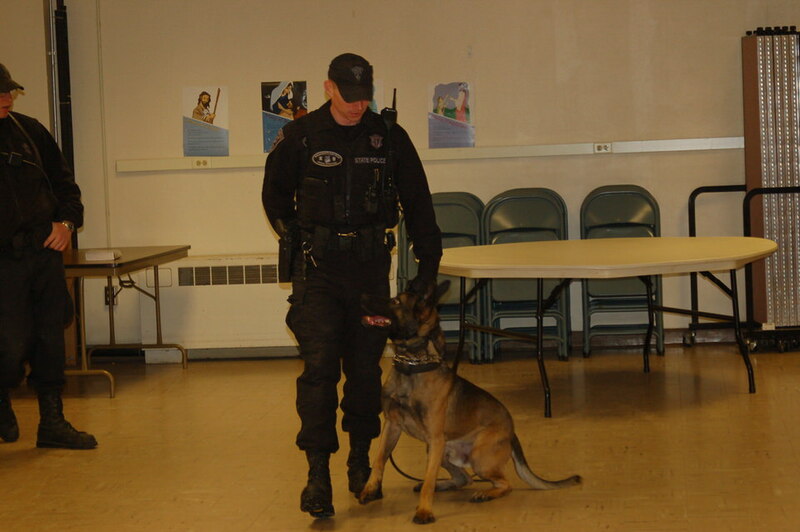 Tank going after the ‘bad guy’, Officer Chris. 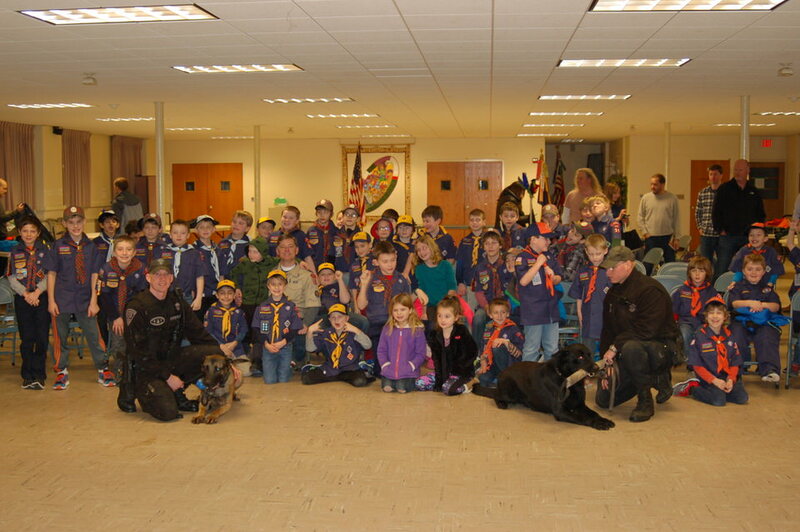 Pack 39 with Officer Chris, Devaney, Officer Tom and Tank. Enjoy more photos from this fun and exciting Pack Meeting. EVERY scout must pick up their popcorn from Chris Hays’ house. 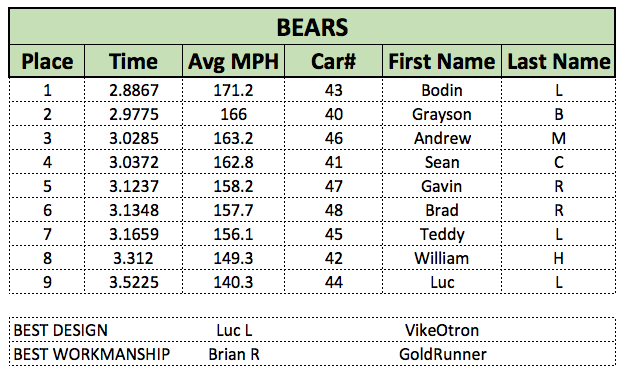 ****If you are unable to pickup your order, please talk to your den leader or another scout to pick up for you. Our November meeting is focused on Service., Doing service projects together is one way that Cub Scouts keep their promise “to help other people.” While a Scout should do his best to help other people every day, a group service project is a bigger way to help people. While you’re giving service, you’re learning to work together with others to do something that’s good for your community. Thank you to all the families who brought a food item and cans to be recycled to help the Stow Food Pantry. 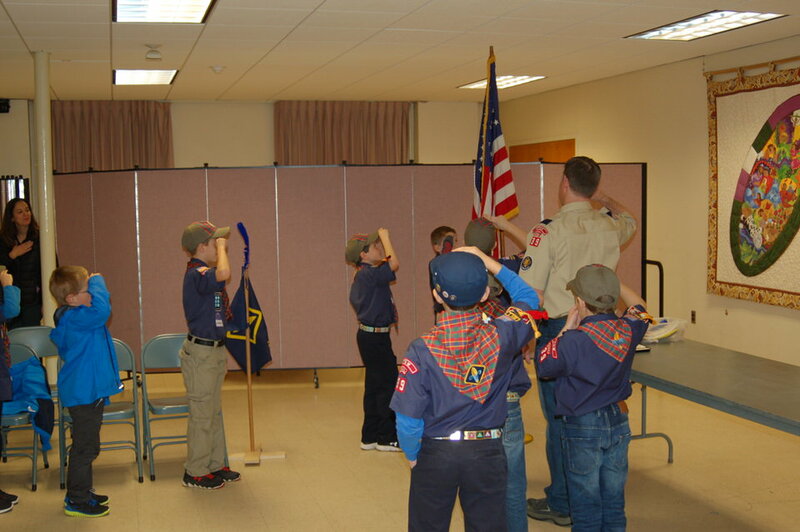 WEBELOS Den 2 opened the meeting by presenting the American and Cub Scout Flag, then lead us in the Pledge of Allegiance. 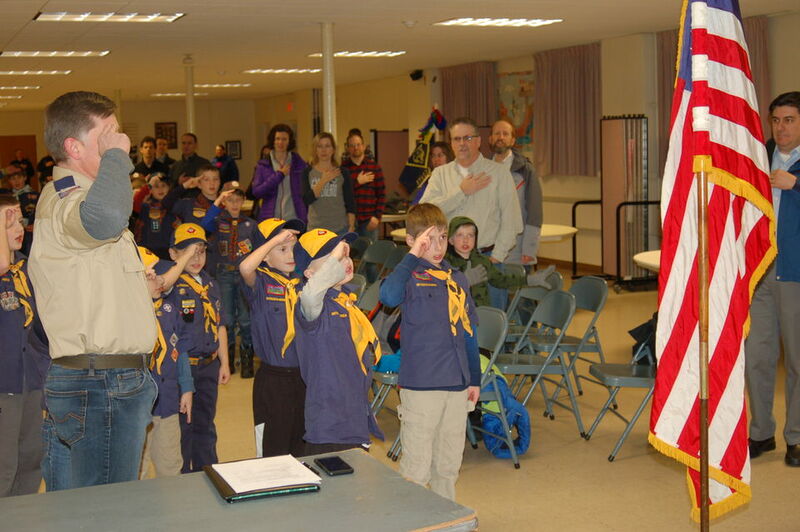 We then recited the scout oath lead by one of our Bear Scouts. WEBLOS Den 2 has asked all of us to help them deliver toys to deserving children this holiday season through the the Toys for Tot’s Program. Please bring an unwrapped toy to the December Pack Meeting, December 13th. 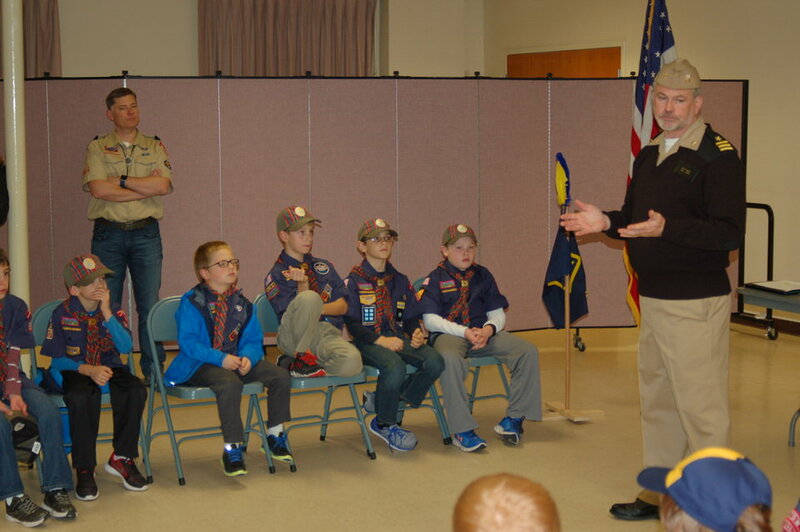 We are very excited to announce the following scout who earned the Bobcat badge during the Pack Meeting. 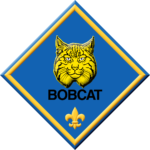 The Bobcat badge is the only badge that every cub scout will earn, not matter the year in which they join cub scouts. Matthew and Brian helped St. Isidore clean up their garden at the end of the season. The vegetables from the garden go to the Stow and Acton food pantries. Den 8 helped at Open table at the Unitarian Church in Stow. They helped clean up after dinner, put all the tables and chairs away, sort silverware and sweep the floor. We were very honored to have Retired US Navy Commander Jeff Lance join us to tell us about what serving in the military is like. He kept the boys captivated with his stories and answered many great questions from the scouts. The scouts then got down to business and wrote thank you cards to the men and women serving on the USS Roosevelt which is currently deployed near Yemen including a few service people from Stow. We had an over the top successful popcorn season and we thank the scouts, the scout families, and the community of Stow to helping us fund our wonderful program. Congratulations to them and all the scouts. The lucky three top sellers got to “pie” the Cubmaster & a volunteer den leader. 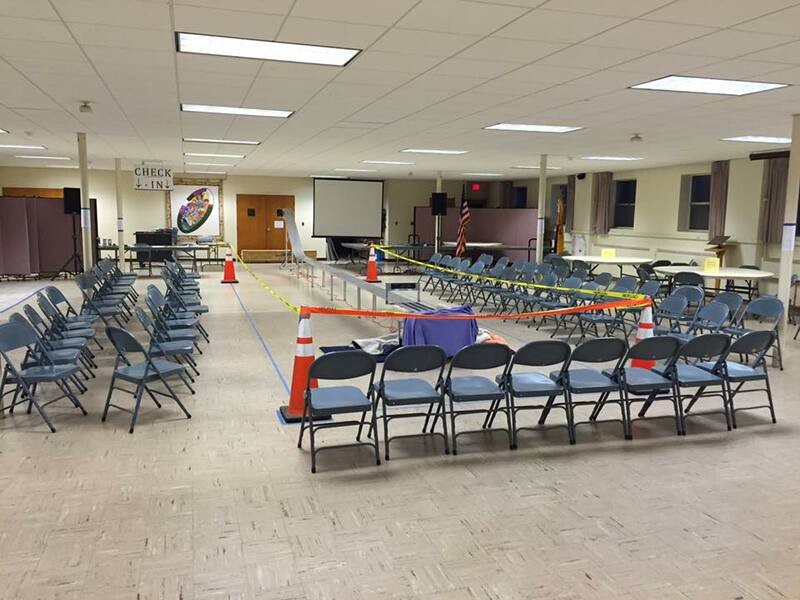 November is Service Project Month for Stow Scout! Please join Den #5 in collecting cans to recycle them. Bring them to St. Isidore Church November 15. The money will be donated to the Food Pantry. There will be a prize for the den with most recyclables. 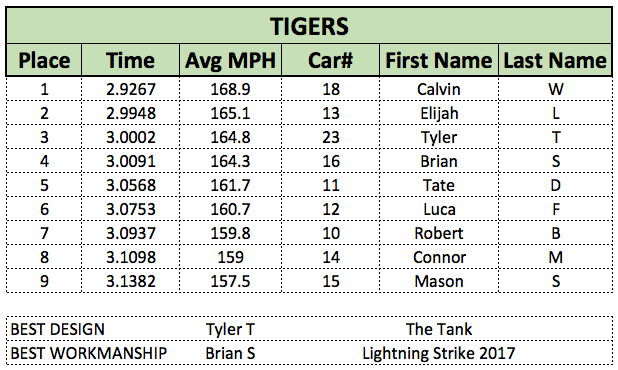 Please join Tiger Den 3 in collecting non-perishable items for the Stow Food Pantry. Youth Protection Cyber Chip are a two part requirement. Both are required for completion of each rank, to be refreshed every year. Youth Protection is completed at home while Cyber Chip may be completed at home or as a den. 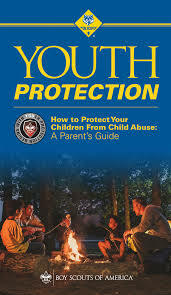 Youth Protection– parents review the pamphlet attached to the front of the Cub Scout Handbook, titled: “Youth Protection/ How to Protect Your Child from Child Abuse: A Parent’s Guide”. 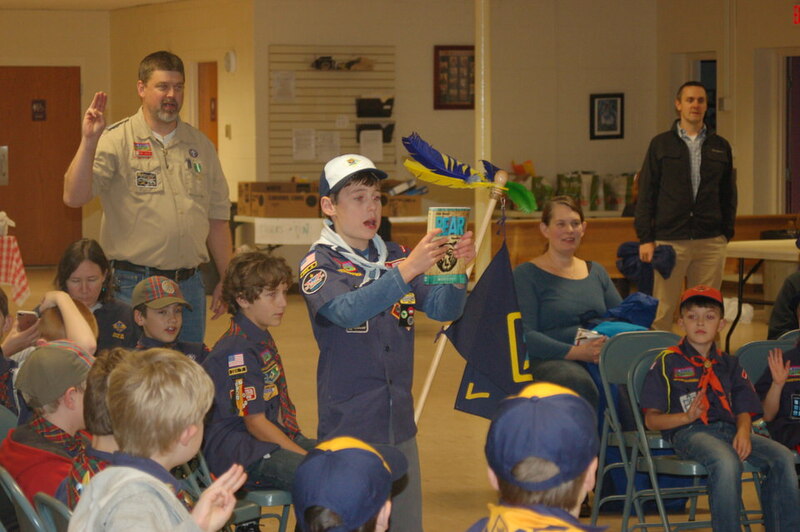 After the parent reads through the book, the exercises on pages 15-19 of the guide are completed with the scout. There is no place to sign off completion in the book; let your den leader know when the exercises have been completed. 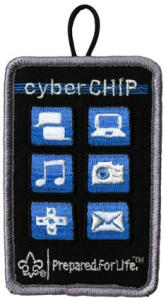 Cyber Chip– this is designed to help protect your child while using the internet. You and your son will need to go online to complete this requirement. Navigate to website: www.scouting.org/cyberchip NOTE: The website refers to the Cyber Chip card which the scouts are supposed to read however, they won’t actually get the card until they’ve earned it. There is a picture of the card on the website which can be read in lieu. 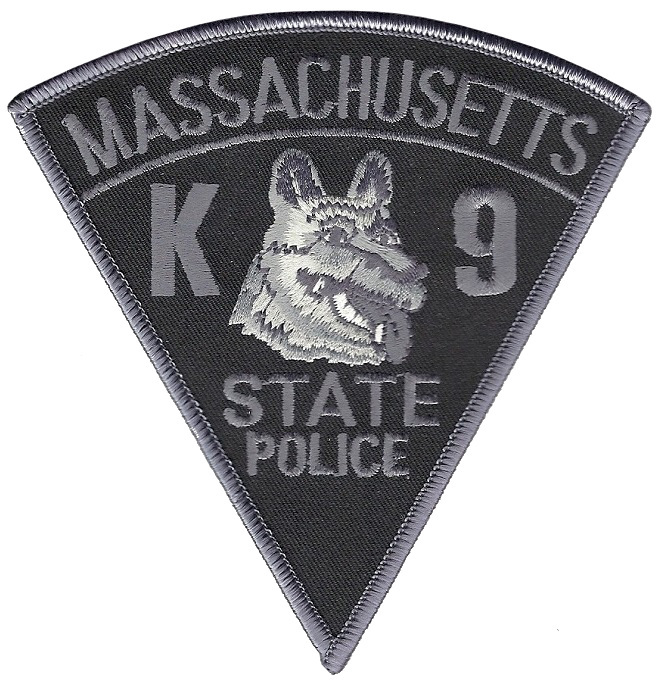 Once the requirements are met, the card will be presented at a pack meeting, along with the Cyber Chip patch. 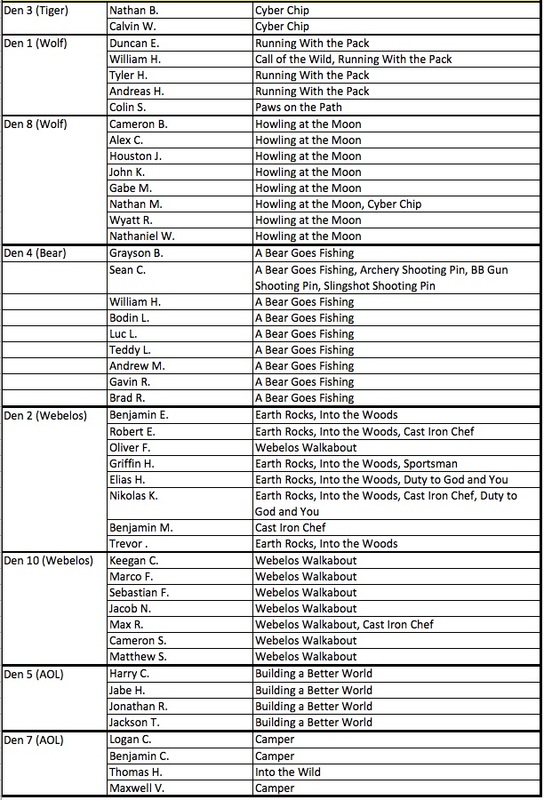 Select the age-appropriate link for your rank, “Grades 1-3” for Tiger-Bear and “Grades 4-5” for Webelos scouts and complete the four listed steps. Tell your den leader when your scout has completed the appropriate exercises so the requirement/s can be documented in YouthManager. 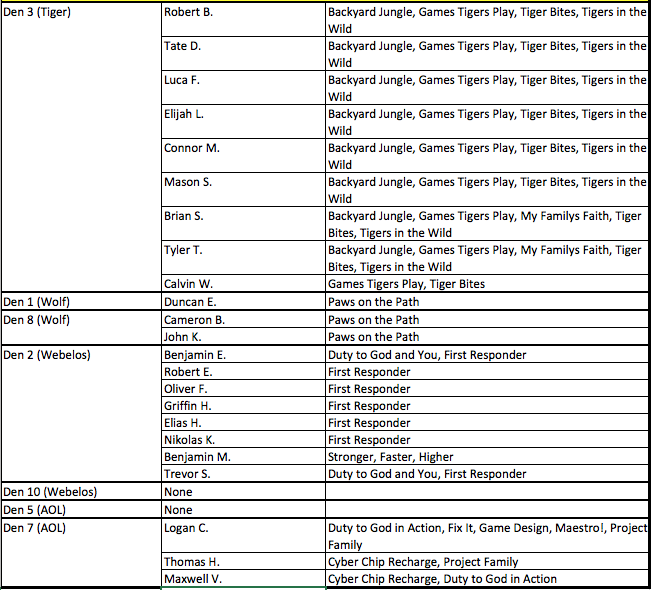 The first year the Cyber Chip is completed, the scout will receive a temporary patch*; subsequent years will be considered ‘refresher’ training, with no patch granted but the den leaders will still need to check off as completed in order to meet the rank requirements.